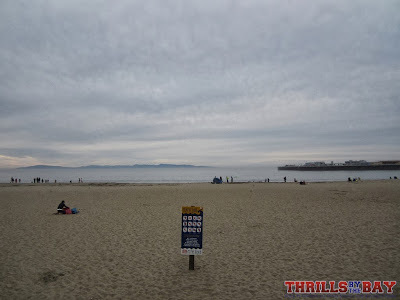 …and it is all set on a Northern Californian beach right next to the great Pacific Ocean. This place is none other than Santa Cruz Beach Boardwalk. 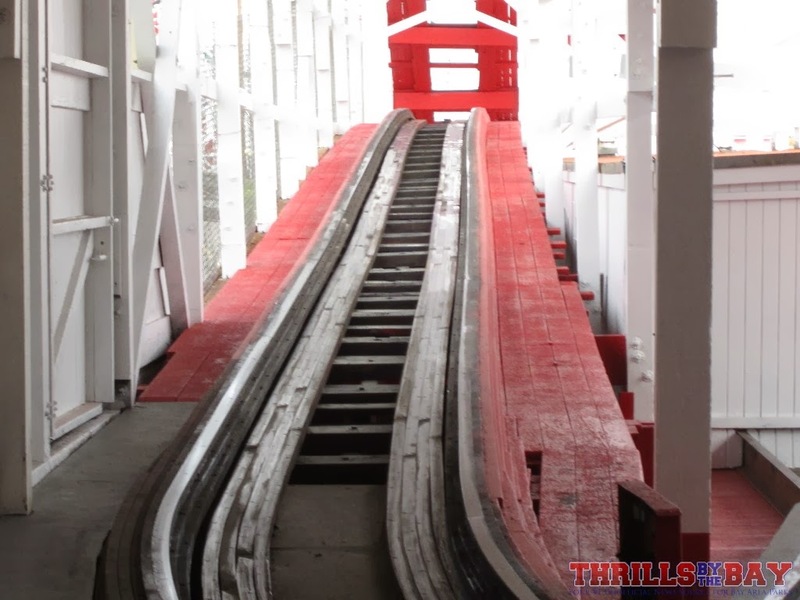 Opened in 1907, this oceanfront amusement park is currently one of the few remaining examples of its kind, and is still going strong today. The Boardwalk has been ranked multiple times as the #1 seaside amusement park in the world by Amusement Today’s Golden Ticket Awards, and it isn’t hard to see why. 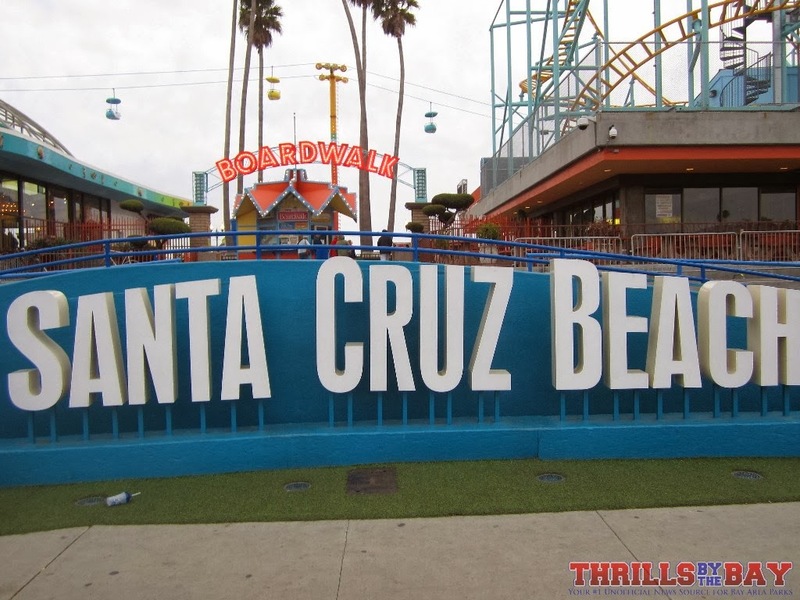 With great rides, great food, fun games, and a beautiful setting, Santa Cruz Beach Boardwalk is one of the top attractions on the California coast. 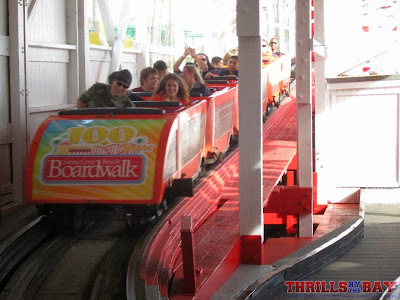 Without further ado, let’s dive right in and check out what the Boardwalk has to offer. First, we have the Boardwalk’s most recent addition to its ride collection, Undertow. This new for 2013 Maurer Söhne spinning coaster replaces Hurricane, a steel coaster of similar caliber that operated from 1992 to 2012 and got relocated to Western Playland in New Mexico this past year. 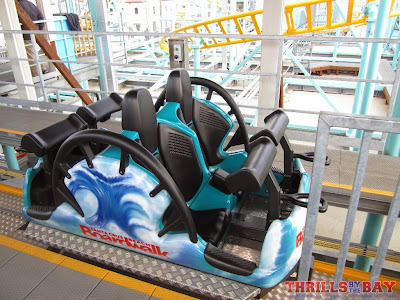 Undertow is one of the newest variations of Maurer Söhne’s “Xtended SC 2000” off-the-shelf model of spinning coasters. 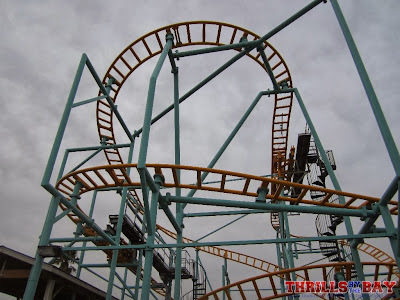 It has almost exactly the same layout as other SC 2000s, but the track and supports are slightly modified from previous variations of the same model. 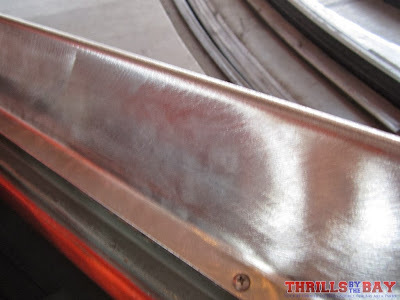 Some of the turns have slightly smoother profiling as to avoid painful jolts and increase reridability, and the footprint dimensions are also a little different. 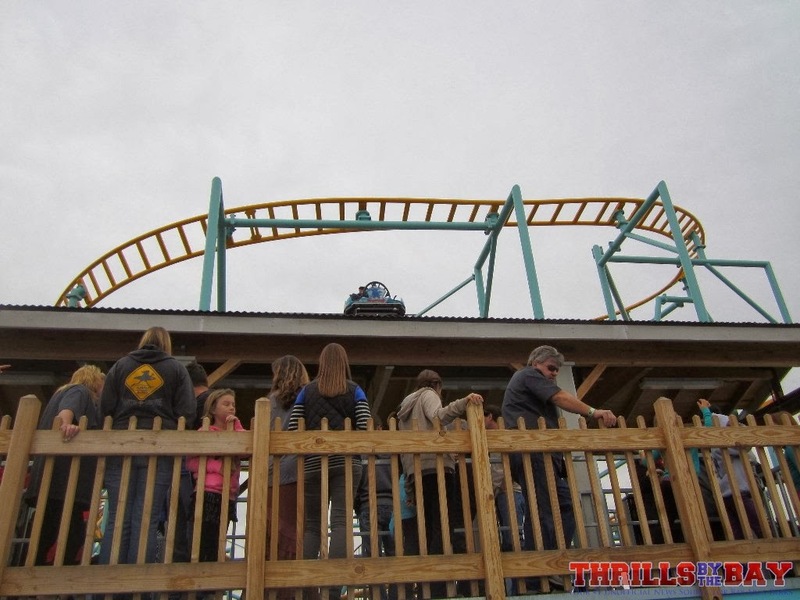 Undertow was scheduled to open this past summer supposedly right around 4th of July, but got delayed for months due to some teething problems with construction. In layman’s terms, Maurer Söhne delivered the parts in a weird order, say you get delivered the chain and handlebars of a bicycle before the frame and the wheels. 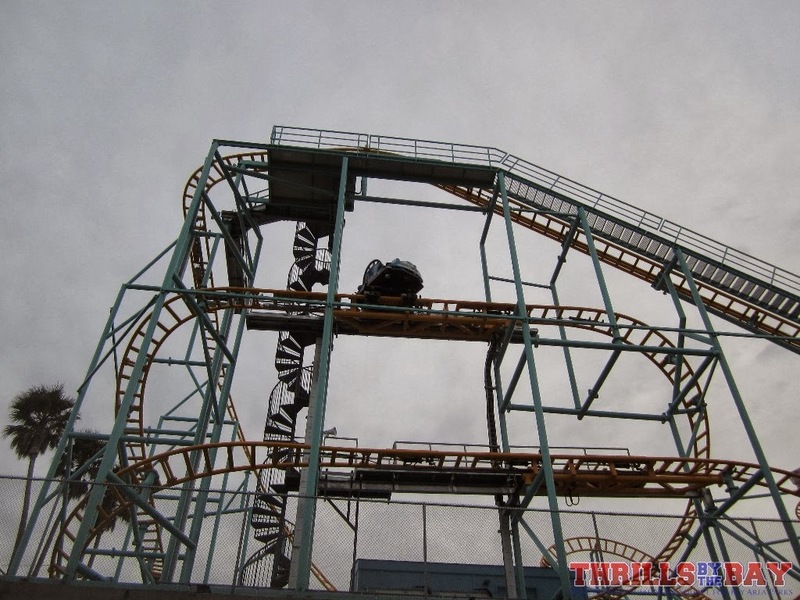 Further complications came up when the track didn’t fit together, supposedly a mistake made in the Maurer Söhne factory. This forced the Boardwalk to get a local contractor to literally bend the track into place. 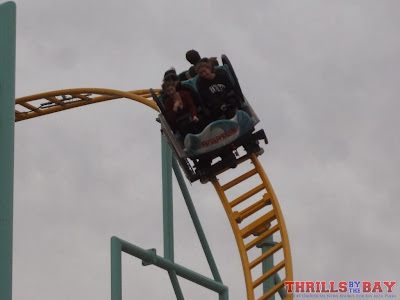 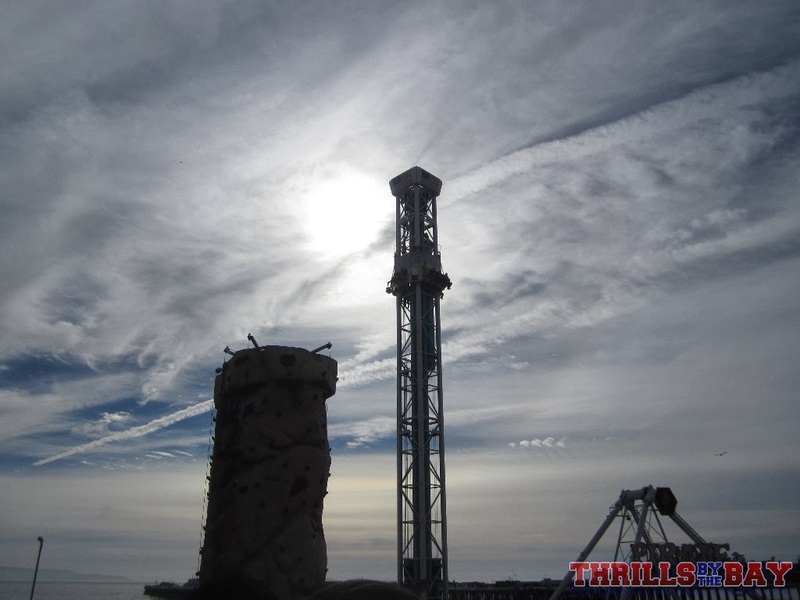 Testing then began in early fall, and the ride finally soft opened on October 19th, 2013. 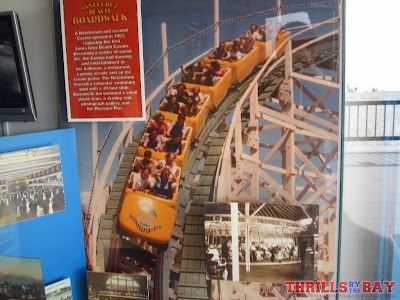 A grand opening ceremony will be held for the ride in spring 2014. This was the list of operating rides during my visit on December 27th, 2013. The Boardwalk selects certain rides to operate on limited operation days, with Undertow operating on all limited ops days not only so the public can ride it, but also so kinks can be worked out before the busy summer. 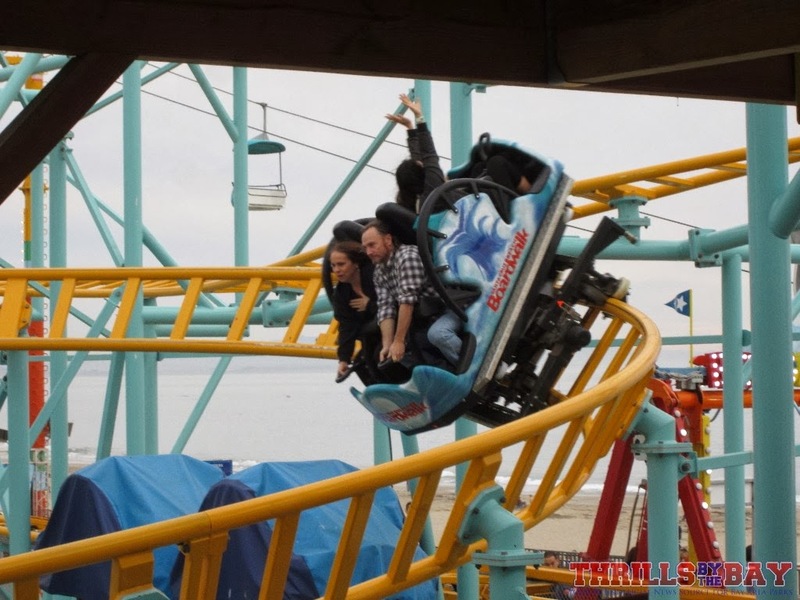 On to the ride itself, Undertow delivers a different ride experience every time due to the cars’ ability to spin freely as they go. 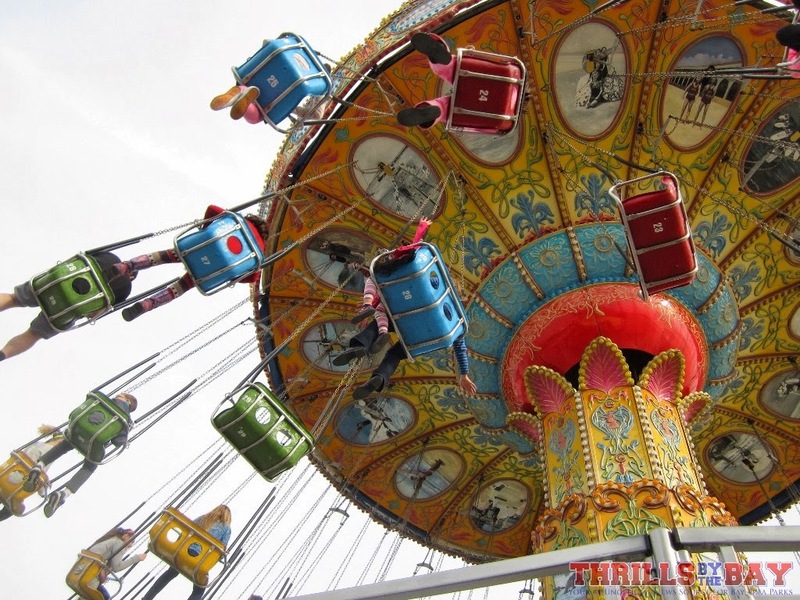 The ride has a mixture of drops, twists, and turns that’ll feel different with every ride! 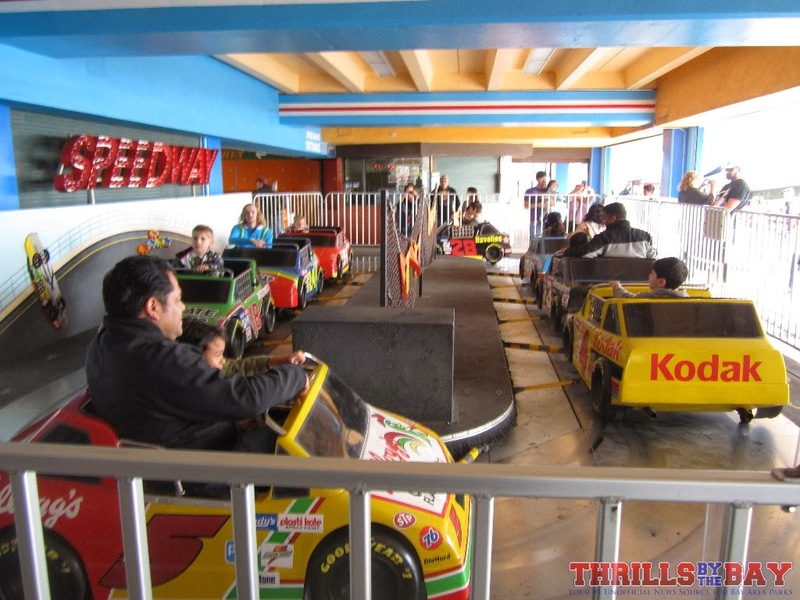 The cars track smoothly, making it very reridable. 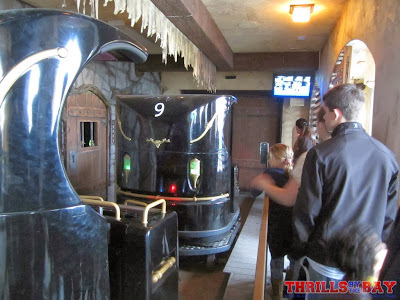 Lastly, just like almost every other ride at the Boardwalk, operations are very efficient. 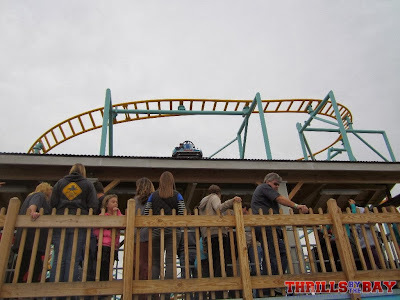 I recorded dispatch times of as low as 24 seconds on my visit, which is well above average for a coaster running single car trains. I never waited more than 15 minutes on my visit, which had a fair amount of crowds for being a limited op day. 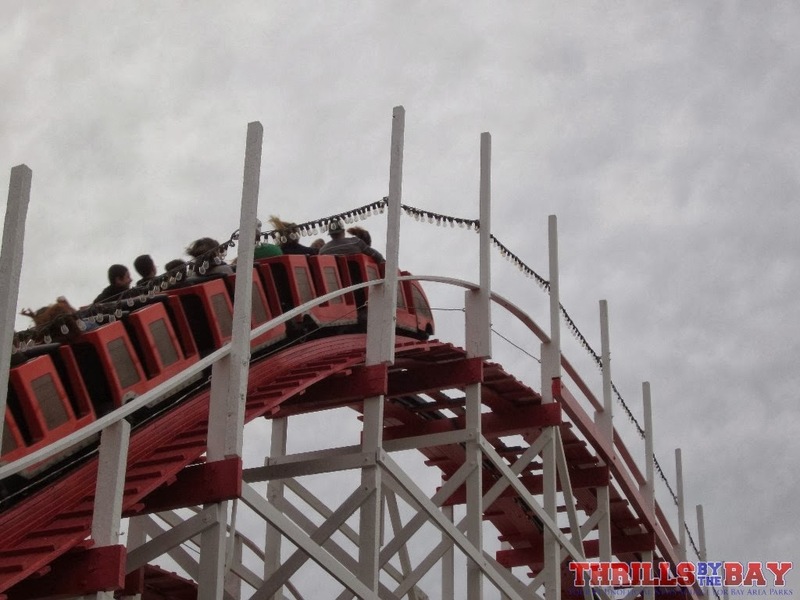 Combine the efficient operations with the kinks getting worked out, and this ride will be in prime shape for its first summer. 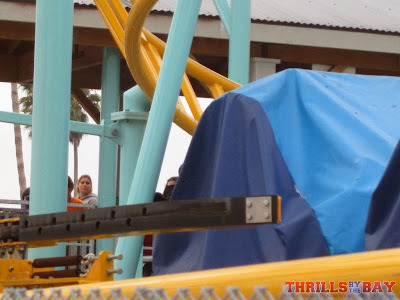 This is the first, lower section of Undertow’s queue. Switchbacks will most likely be set up here for the summer. Undertow’s lift hill design is interesting in that the chain is detached at the bottom. 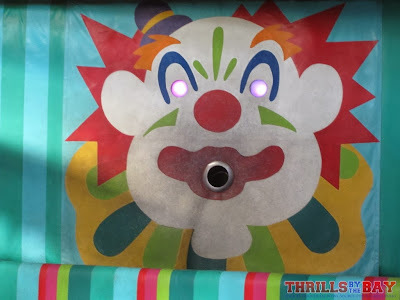 This can be found on other Maurer spinners and some Wild Mouse coasters. 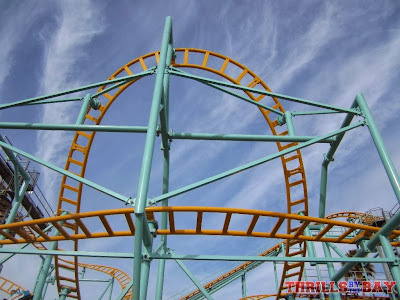 makes it look as though the car is rolling on the station’s roof. 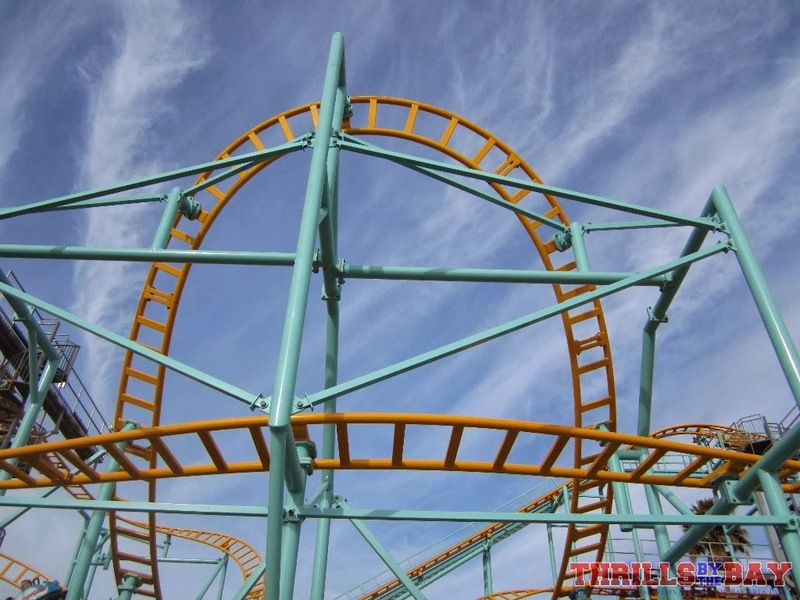 back into a straight forward/backward position. We now move on to some of the other Boardwalk attractions, starting with the most famous of them: the Giant Dipper. 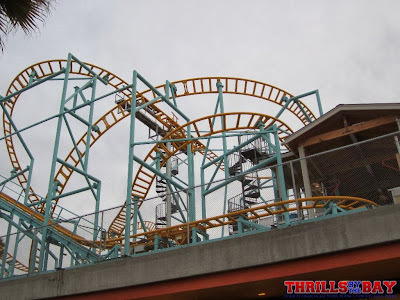 In brief, the story of this wooden roller coaster is that the Boardwalk had an LA Thomson scenic railway, but it wasn’t thrilling enough. 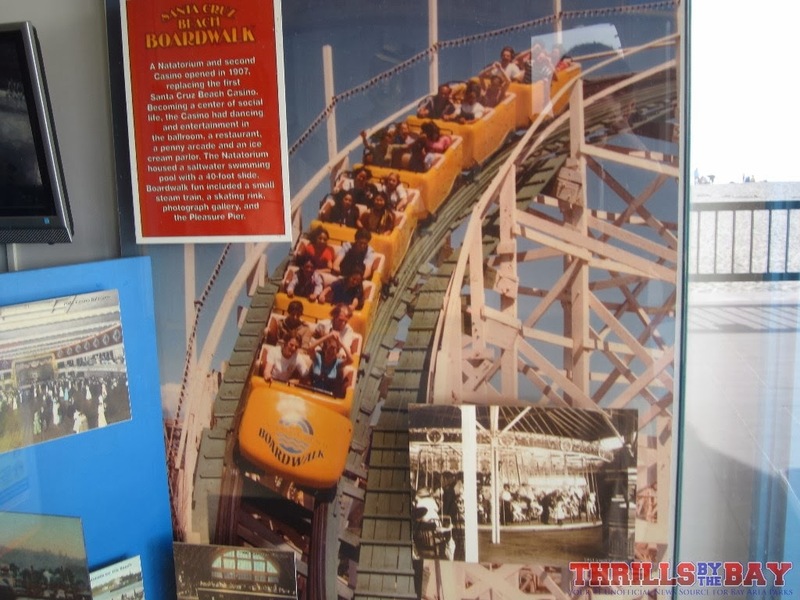 They called up legendary (for the time, and still now) coaster designers Tom Prior and Frederick Church (Prior & Church, or just P&C) to design a thrilling new ride that would be taller, faster, and crazier than the scenic railway. Arthur Looff (son of Charles Looff, who made the Boardwalk’s carousel in 1911) supervised the construction of the woodie, which sprang up in just 47 days and cost a mere $50000, something a park can only dream about today! 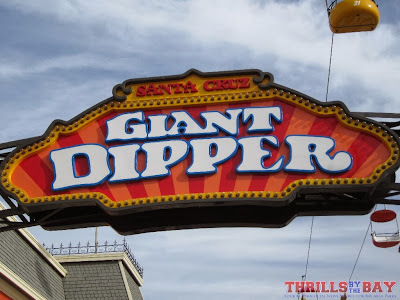 Giant Dipper opened on May 17th, 1924, and has been thrilling riders ever since. The ride is meticulously maintained and runs smooth all the time. Not only that, but the ride itself still packs a punch with some good airtime and almost unparalleled laterals. Operations are very efficient on the Dipper, with the 6-car trains getting dispatch times of almost always under a minute. 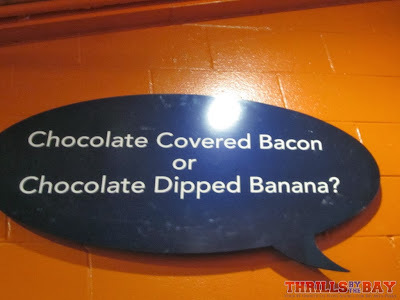 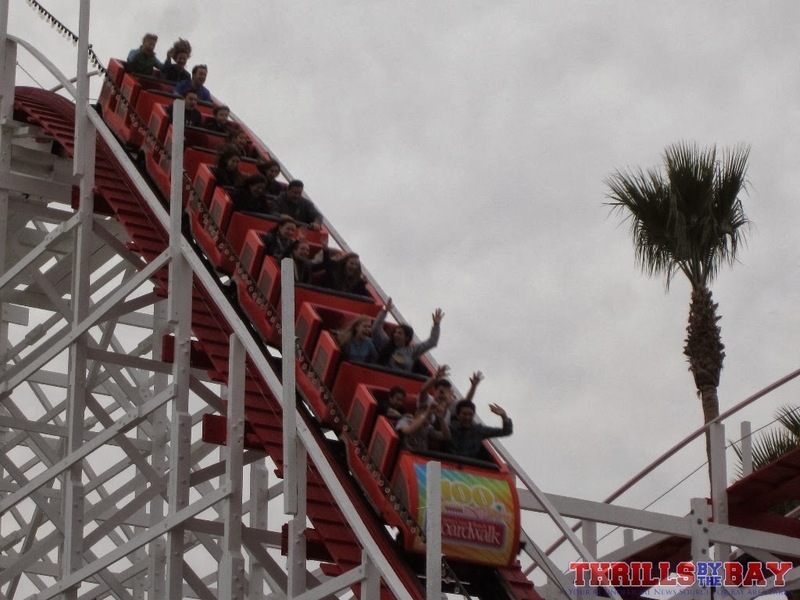 This is an absolute must-ride when visiting the Boardwalk! that still use the old skid brake system. 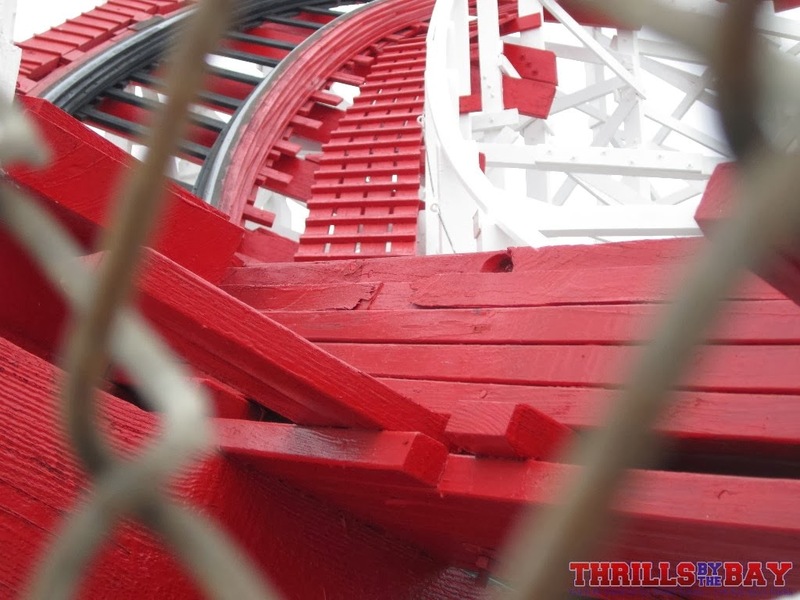 and its unmistakable red and white structure is now more vibrant than ever. These question bubbles were also recently added as part of the repainting project. 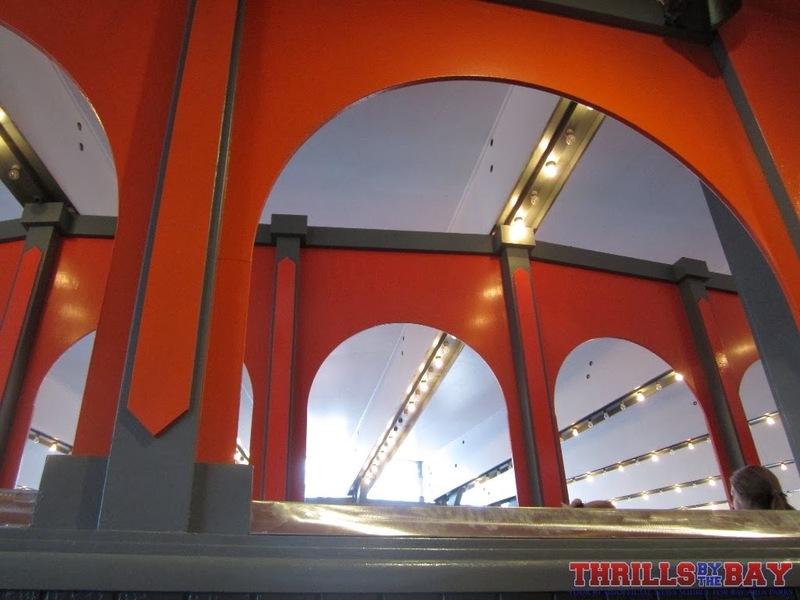 handrails received some TLC this past year. Giant Dipper hasn’t always been red and white. 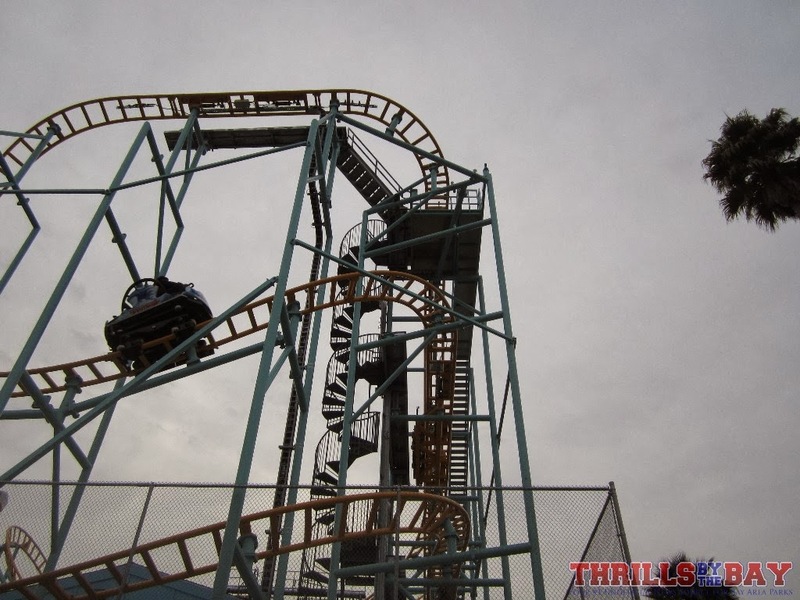 This photo here shows a green and white paint job, as well as Arrow trains. Giant Dipper opened with P&C’s single bench Century Flyer trains, then switched to Arrow in the 1970s, and then to Morgan in 1983. The Morgan trains are the ones currently running today. 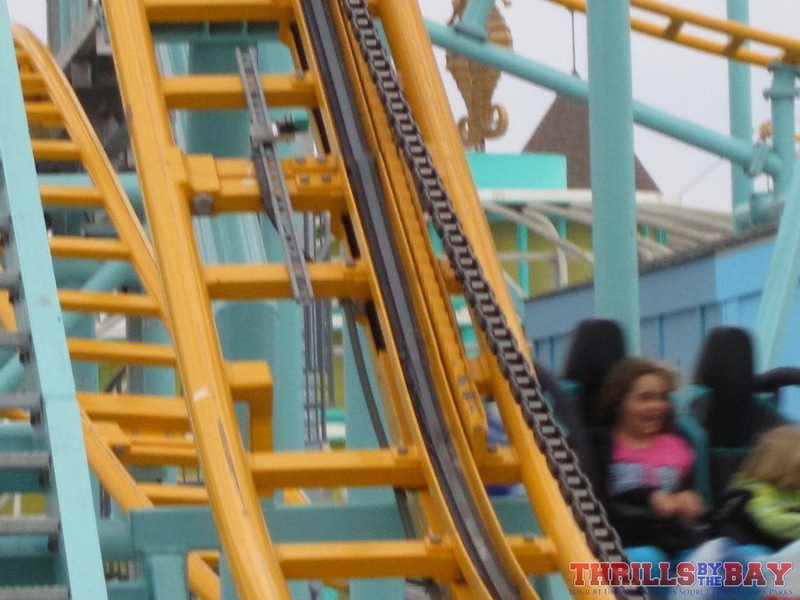 The next set of pictures will cover some more Boardwalk attractions, enjoy! 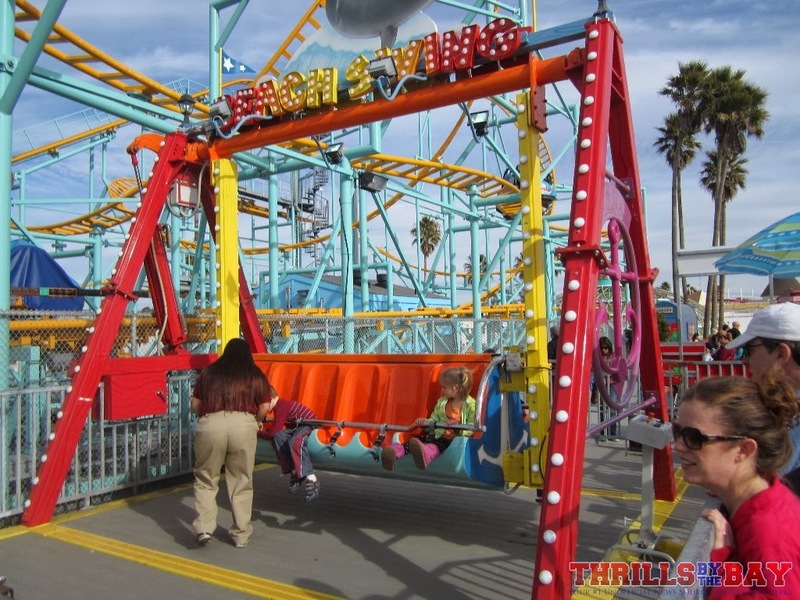 This brand new Zamperla Happy Swing, Beach Swing, was opened this past summer. Kids love it! 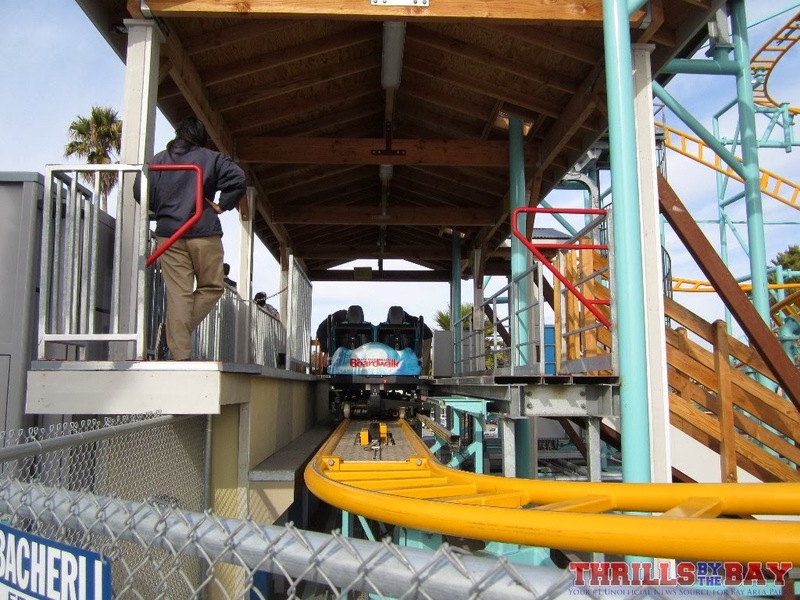 “Double Shot” model specializes not in size, but in airtime. 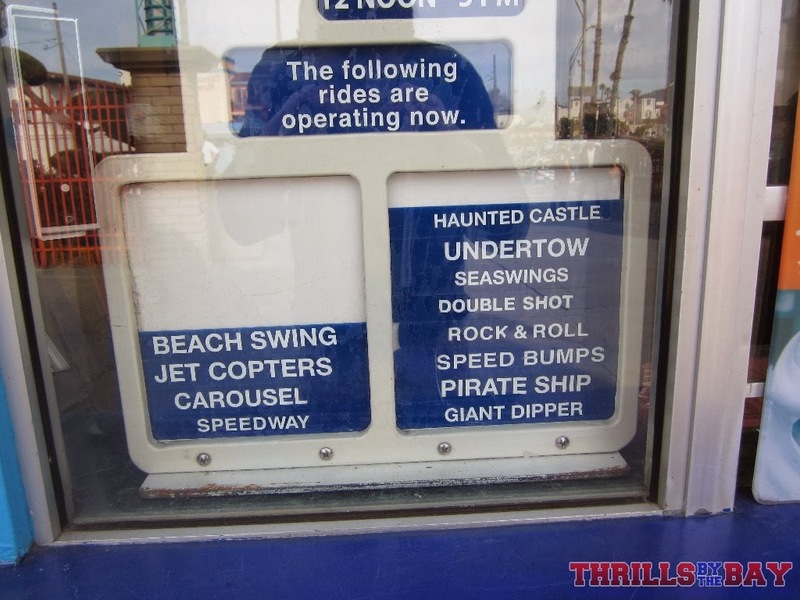 And this here is Sea Swings. 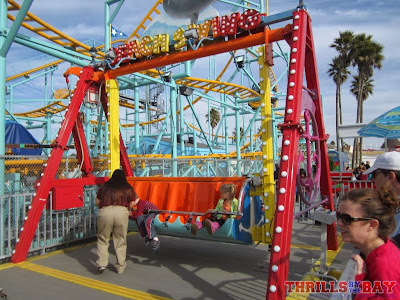 Chairswing rides are among the most common flat rides in existence. Speedway here is a miniature version of the classic “whip” ride. 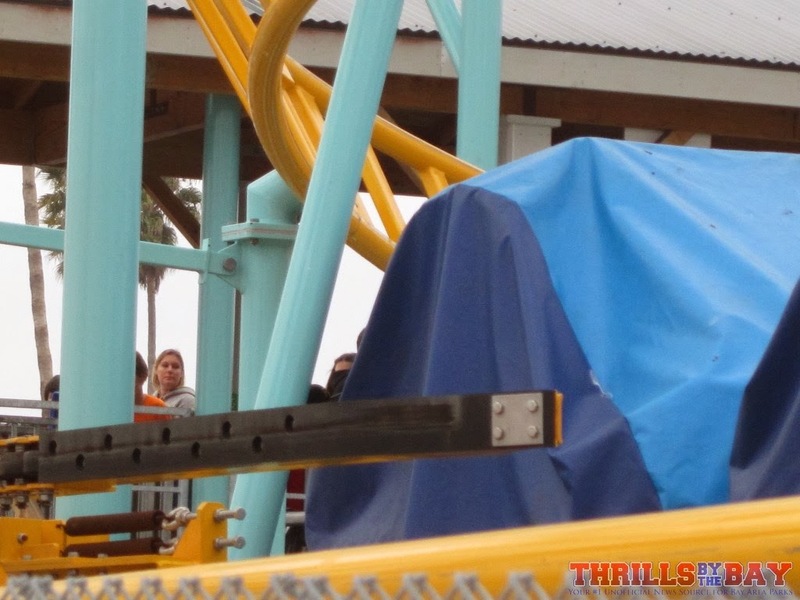 The cars whip around the corner and produce some nice laterals. 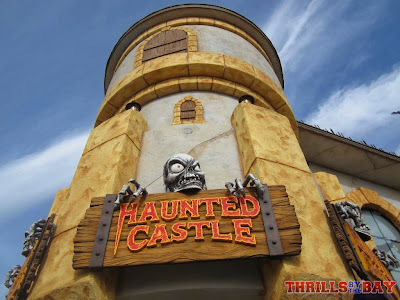 Haunted Castle is one of only three dark rides in Northern California, and the Boardwalk has all three of them. 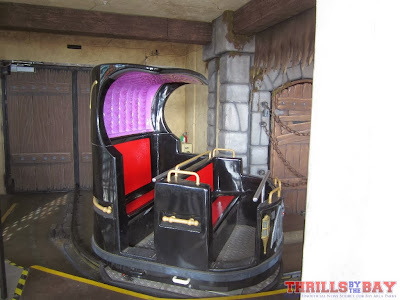 This dark ride received an extensive makeover from well-known dark ride manufacturer Sally Corp in 2010. New spinning cars were installed, and an entirely new layout was built, all in the basement level of the Boardwalk. 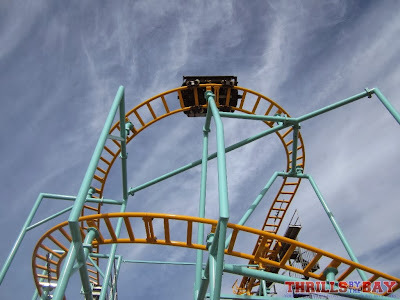 indicating a need for a major rehab before the off-season ends. 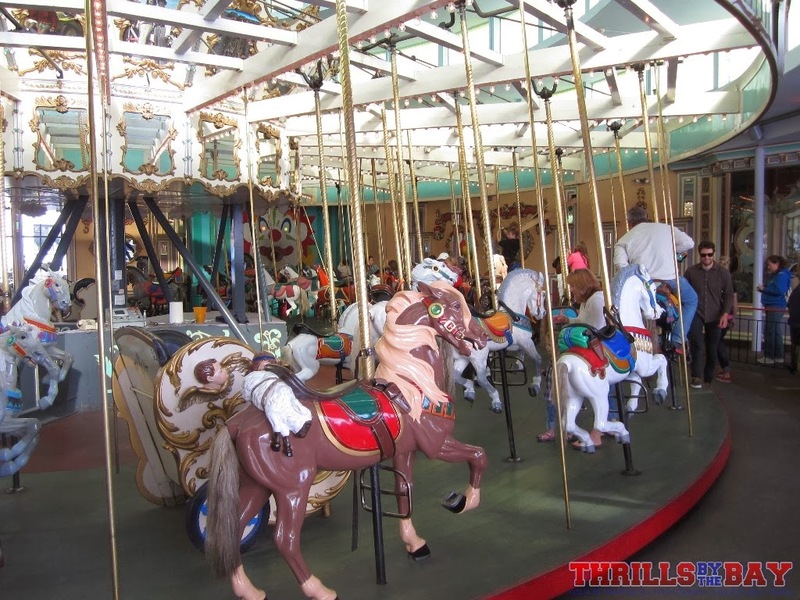 This is Santa Cruz Beach Boardwalk’s other famous attraction, the 1911 Charles Looff carousel. 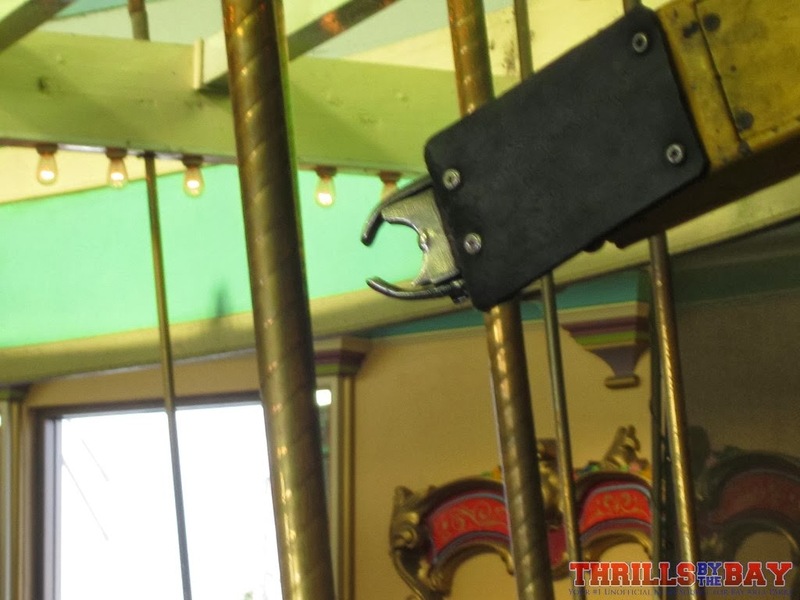 This carousel is one of the last remaining to feature a ring dispenser. has taken good care of it and it continues to dispense rings to this day. Once you grab a ring from the dispenser, try to throw it into the clown’s mouth. 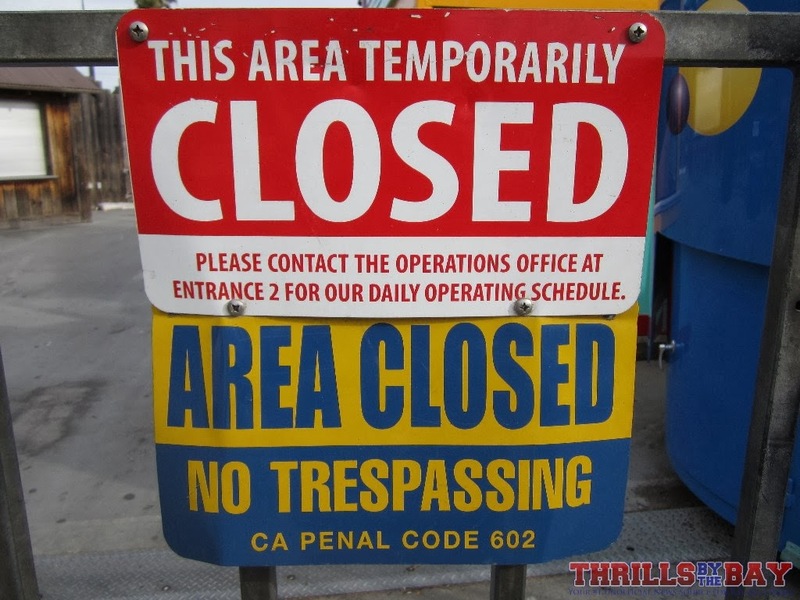 A little warning: It’s not easy! 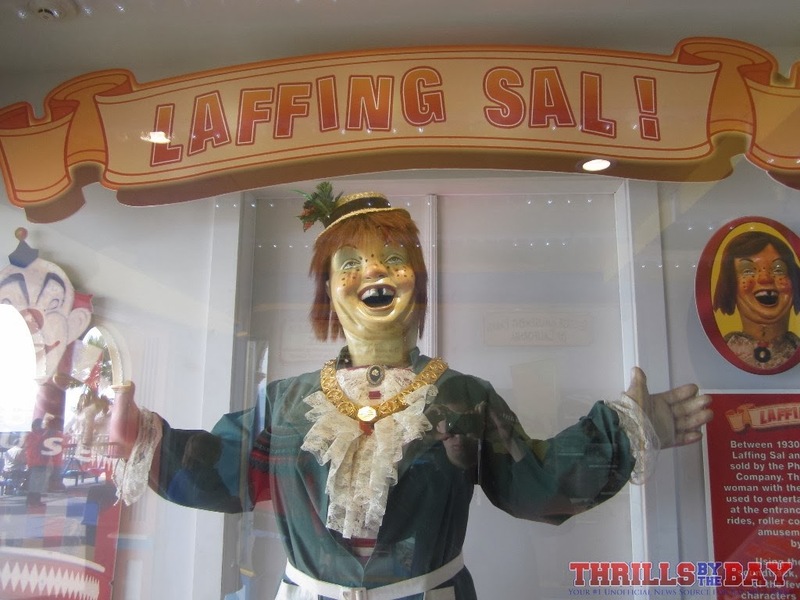 This is Laffing Sal, an animatronic figure made by PTC (Philadelphia Toboggan Company). This one originally existed at Playland by the Beach in San Francisco. Beyond this sign is the eastern half of the Boardwalk, home to Logger’s Revenge (Arrow log flume) and some really awesome flat rides like Rock-o-Plane (Lee Eyerly), Wipeout (HUSS Breakdance 4), and Crazy Surf (KMG X-Factory). All of these rides are closed during limited op for winter maintenance rehabs. 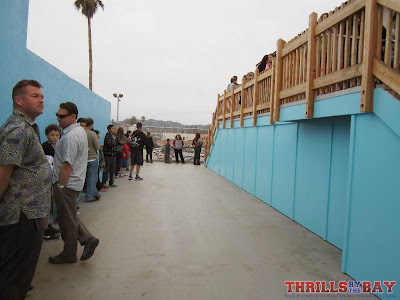 And that wraps up the first Santa Cruz Beach Boardwalk update here on Thrills by the Bay, thanks for reading! Be sure to follow Thrills by the Bay a like on Facebook for more updates!